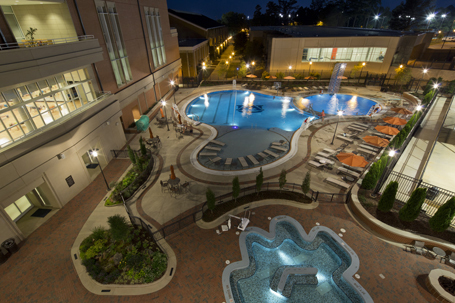 In August 2013, Auburn University dedicated its new 240,000 sq. ft. recreation and wellness center. The facility was designed to provide recreational space for Auburn students, faculty and staff to use in their pursuit of a healthier lifestyle. The students voted for an increase in fees and were instrumental in the planning stages of the facility. Surrounded by a large outdoor pool and leisure area, the feeling of being outdoors was brought into the center through the tranquil Livingston Courtyard area featuring benches, plants and a water fountain. Outlying areas of the courtyard include racquetball courts, weight training areas, and group exercise studios. Other center amenities include cardio/fitness training areas, eight basketball courts, a golf simulator, strength equipment, a multipurpose court, and a game room.